I believe strongly in the old cliché about what to do if life hands you a ton of lemons: set to and make the very best lemonade you can. So when I wound up working in Hong Kong, I thought the worthiest use of my spare time was to write the first history of beer in Hong Kong. This turned out to be vastly easier than I had feared, because the Hong Kong library service had digitised every English language newspaper produced in the colony back to the 1850s, and while the OCR wasn’t perfect (it never is), it still threw up a mass of detail about Hong Kong’s brewing pioneers, much of it fascinating. And gave me a surprise on my doorstep. Beer and Hong Kong were mixed up right from the moment the British seized the island in 1841 during our row with China over whether or not our traders should be allowed to sell the Chinese opium: for some reason the Emperor of China felt foreigners flogging his subject hard drugs and getting them addicted just to turn a profit wasn’t really on. Naturally, the British went to war on behalf of the drug pushers. Indeed, as I suggested in the article that eventually ended up in Brewery History magazine, it’s arguable that if it hadn’t been for alcohol, Britain would never have seized Hong Kong. To quote myself from Brewery History magazine: One of the crucial events leading up to the start of the First Opium War happened on July 12 1839, when seamen from two sailing ships owned by the British trading company Jardine Matheson, sheltering in the natural harbour between Hong Kong island and the mainland, were on Sunday shore leave on the mainland, Kowloon side. They were joined by others sailors, British and American, and got stuck into the “sam shu”, san shao, distilled rice liqueur, in a Kowloon inn. When that ran out, it appears, they moved on to what was then the neighbouring village of “Jianshazui”, today the district of Tsim Sha Tsui, in search of fresh supplies. Several houses were raided by the sailors, a Taoist temple vandalised, a fight broke out with the locals, in which, according to one report “many of both sexes, including children and women 70 years of age” were “desperately wounded” , and one villager, Lin Weixi, or Wei-hsi, was struck across the chest with a stick, dying the next day. The British Chief Superintendant of Trade in China, Captain Charles Elliot, effectively London’s representative in the region, was with the merchant fleet, trying to negotiate with the Chinese over the opium question. He paid Lin’s family 1,500 silver dollars, put up $200 as a reward for evidence leading to the murderer’s conviction, and handed out $500 in general bribes to the locals. Elliot also held a court of inquiry into Lin’s death on board one of the ships off Hong Kong. Five sailors were tried for the affray and found guilty of riot, but on the evidence as presented, no murderer could be identified. The British sailors blamed the Americans, who, they said, had drunk more of the san shao. The Chinese High Commissioner in Canton (today Guangzhou), Lin Zexu (or Tse-Hsu), had been sent in March that year by the Emperor of China, Daoguang, to stop the British bringing opium into the country, and had already destroyed more than a thousand tonnes of British opium. With the weight of a proud and ancient nation behind him, he demanded that the British hand over the murderer of Lin Weixi. Elliot refused to hand anybody over, saying it had not been possible to identify who struck the killer blow. In addition, Elliott knew that anyone who was handed over to the Chinese would quite likely simply have been summarily executed – which would have caused outrage back in Britain. In retaliation for this refusal, an angry Lin Zexu ordered his countrymen not to supply the British ships with food or water, poisoned wells known to be used by the British, and told the Portuguese authorities in Macau, the Portuguese-owned settlement on the other side of the Pearl River delta, not to supply the British either, and to drive all British ships there out of the harbour. The Portuguese, who had been in Macau since 1557, complied with Chinese orders, unwilling to upset the Emperor. Lin Zexu’s orders resulted in several skirmishes between British ships and the Chinese fleet in which a number of junks were sunk. The rumbling argument broke out into an official declaration of war in London early the following year, in large part to secure compensation for the opium destroyed by Lin, with 4,000 marines and four steam-powered gunboats sent to the Pearl River delta from Singapore. As part of the subsequent fighting, Elliot, apparently deciding that the Portuguese in Macau could not be trusted and Britain needed its own territorial base in China, seized Hong Kong island in the name of Queen Victoria. This de facto land-grab became de jure in August 1842 with the signing of the Treaty of Nanking that ended the First Opium War and handed Hong Kong officially to Britain. It could, perhaps, be argued that if the sailors in Hong Kong harbour had had access to supplies of beer, they would never have gone drinking san shao in Kowloon, Lin Weixi would not have died, the Portuguese would not have been forced by the Chinese to bar the British from Macau, and the British would never have decided they needed Hong Kong as a secure home of their own to conduct trade with China from. On the other hand, the natural harbour between Hong Kong island and the mainland – quickly named Victoria Harbour by the British – was a prize worth seizing by anyone. Whatever might have happened, on January 26 1841 the British took physical possession of Hong Kong. By April 1842, even before Hong Kong’s capture had been ratified by the Treaty of Nanjing, Alexander Matheson of Jardine Matheson was reporting that beer, porter and pickles were “pouring into this market, ten times as much as a whole army could consume”, with the company’s newly built godown in Hong Kong “full of the stuff”. By 1869 English beer “of excellent quality” was being brewed in Shanghai, 900 miles north along the coast, by “Messers Evans and Co, who during the season have sold between Shanghai and the outports over 50,000 gallons of beer”, that is, about 1,400 barrels. However, while it very well might have, there is no evidence that Evans’s beer reached Hong Kong. (This mention of Evans’s brewery, incidentally, knocks on the head the claim by Tsingtao to be the first Western brewery in China.) Meanwhile the colony’s tastes were changing: British ale and stout were being replaced by lager. As early as May 1876 the Hong Kong importer and retailer Lane Crawford was advertising “Danish beer from the Tuborgs Fabrikker”, Tuborg then being just three years old. In 1886, beer from the Brauerei Zur Eiche in Kiel, North Germany was being advertised for sale in the colony. By 1896 the Seattle Brewing and Malting Co had opened an agency for China and Japan in D’Agulier Street, Hong Kong, and was selling “Braun’s ‘Export’ Beer”. Lager beer from the Anheuser-Busch Brewing Association (brand unstated), presumably imported all the way from St Louis, was on sale in Hong Kong in 1899. Two years later, in 1901, Hongkongers were being offered Kirin from Japan, “a delicate lager”, in quarts and pints. Then in August 1903 the China Mail newspaper reported: “We hear arrangements have been made to start a Brewing Company in Hongkong. As Breweries have been conducted successfully in Manila [that was San Miguel, founded in 1890], Shanghai and in Japan for some years, there seems no reason why a similar success should not attend a Brewing Company in Hongkong, provided it is under able management. 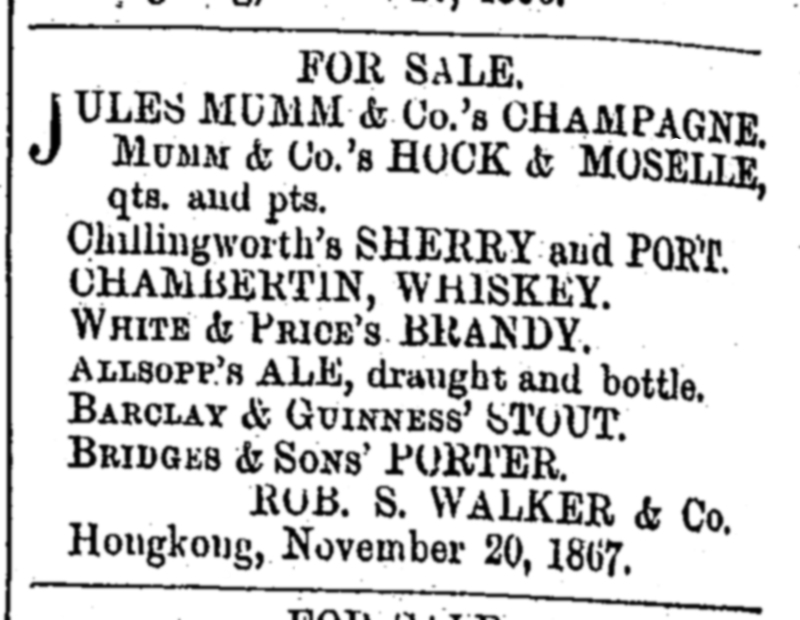 The amount of beer that is consumed in Hongkong in the course of a year must be tremendous, and the consumption is more likely to increase than decrease, in spite of the efforts of the Temperance Party.” The concern the China Mail had heard rumours about appears to have been the Hongkong Brewery Company Ltd, which held its first shareholders’ meeting at 15 Queen’s Road, Central on February 15, 1904. The shareholders were told that the company intended to erect a brewery alongside the Metropole Hotel, on the then Shaukiwan Road (now King’s Road) at North Point, some three miles east of what was then Hong King proper, and by what was then the seashore (land reclamation means that today’s shoreline is some 250 yards further north). The chosen site was “practically the bed of a watercourse”, shareholders were told, and via that watercourse, an “abundance of pure, good water, suitable for beer brewing purposes” ran through the site. I was staggered when I read that: because the site of the former Metropole Hotel was literally right outside the front door of the apartment block where I was living in North Point. Indeed, the 26-storey block that now stands on the site, with shops on three floors and apartments above, is still called the Metropole Building. Could some strange Jungian synchronicity have brought me to live right by where Hong Kong’s first brewery was founded? Alas, no: although the Hongkong Brewery Company Ltd had found a master brewer in Germany who was “ready to come out and attend to the building and fitting up of the brewery as soon as we are ready for him to come out,” the company never seems to have raised the money to build the brewery, and in 1906 it was wound up. In fact the first brewery in Hong Kong, I discovered, the Imperioal Brewery, opened the following year, 1907, in a converted house in Wong Nai Chung Road, Happy Valley. It only lasted two or three years: but meanwhile another new brewery had started up in the colony, across the water from Hong Kong island in Lai Chi Ko, New Kowloon, which began operations in 1908. The promoters behind the venture were led by an Englishman, Alfred Hocking, who was born in Cornwall, England in 1852 and emigrated to the United States as a young man. After several years he moved to Hawaii where he ran a lumber mill and a sugar plantation before starting the Honolulu Malting and Brewing Company around 1898, building a brewery on Queen Street in 1901 which became famous for Primo lager. The advertising slogan ued by the Oriental Brewery was “The Beer that’s Brewed to Suit the Climate”, and one of its brands was “Prima”, echoing the Honolulu brewery’s Primo brand. However, in October 1912, the Oriental Brewery Limited was in liquidation, and the following year its brewing equipment was dismantled and shipped to Manila, in the Philippines. That was the end of brewing for more than 20 years, until 1933, when a newly built brewery opened at Sham Tseng – a name meaning “deep well” – by the seafront on the Castle Peak Road, in the southern New Territories, and about 11 miles west of Kowloon. The entrepreneur behind the venture, the Hong Kong Brewers and Distillers Ltd, was Jehangir Ruttonjee, a member of a family of Parsee traders who had arrived in Hong Kong in 1884. The equipment was being supplied by the Skoda Works in Pilsen, Czechoslovakia, home, as the new company pointed out, to the original Pilsen lager, and the brewer, Mr V. Woitsch, a graduate Engineer Brewer of the Vienna Brewing Academy, was “for many years technical and commercial director of one of the largest breweries in Pilsen”, the Český plzeňský pivovar (which traded as Světovar, or the “World Brewery”), and later state superintendent of breweries in Czechoslovakia, and his assistant brewmaster, F. Drapal, was a former managing brewer in Czechoslovakia. The brewery held its official opening ceremony in August 1933, an event attended by more than 600 prominent citizens from Hong Kong and Kowloon, driven out to the brewery site in more than 100 cars organised by the Hong Kong Hotel Garage. Catering – “teas, cakes, ices etc” was organised by Lane Crawford in a large open matshed erected for the occasion between the brewery (itself decorated with bunting and hung with flags) and the sea, while music was provided by the Band of the South Wales Borderers. Mrs Borrett, the wife of the General Officer Commanding (that is, commander of British troops in China), Major-General Oswald Borrett, formally opened the doors of the brewery with a silver key (which she was allowed to keep), after which her husband gave a “witty” speech. Unfortunately, macroeconomic matters way outside the company’s control quickly brought it serious problems. It had paid for its plant at an exchange rate of 11.5 pence sterling to the British trade dollar (the then name of the local currency), but when Britain left the gold standard in September 1931, the pound slumped more than 30 per cent against the trade dollar, to one shilling and three pence. At the same time, for political reasons – pressure from senators representing the seven electorally important western silver-producing states – the United States government had been buying silver, which dramatically increased the price of the metal, sending it up almost threefold between 1932 and April 1935. Hong Kong and China were the last places in the world to still tie their currency to silver, and higher silver prices hammered their exchange rates. By the middle of 1935 the trade dollar was nearly two and a half times higher against the pound than it had been in 1930. The following year, Jehangir Ruttonjee incorporated a new firm under almost exactly the same name, the Hong Kong Brewery and Distillery Ltd, and bought the Sham Tseng brewery from the liquidators. In August 1939 the brewery celebrated its sixth anniversary, with a lengthy write-up in the Hongkong Telegraph. The Telegraph’s report revealed that the malt for brewing came from Australia, Canada and Europe, and the hops from Great Britain and “the Continent”. It described the landscaped garden, with flowers laid out to depict the words “H.B. Brewery”; the dormitories for the Chinese staff, “built on the plan of semi-European flats”, with messrooms and cooks; and the separate quarters for the “female operatives” who worked in the bottling hall. The women workers “live like girl students in a school dormitory” under a matron who was also the forewoman during working hours. All the female workers in the bottling hall were required to have “a complete tub bath” twice a day, before starting work in the morning and again in the evening when they left for their quarters. 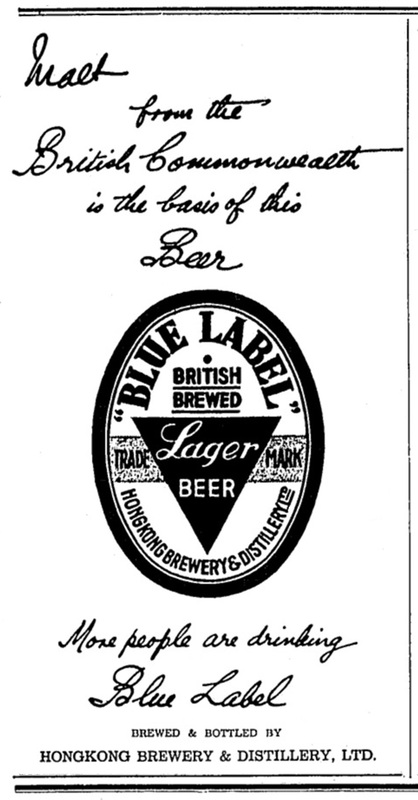 The start of the Second World War seems not to have damaged the brewery’s ability to get raw materials too much, since it was still advertising its Blue Label “British Brewed” lager inside the Hong Kong Sunday Herald on June 9, 1940 when the front page of the newspaper was full of the evacuation of the BEF from the beaches of Dunkirk. At the same time Japanese beer was still being advertised in Hong Kong newspapers. But on December 8 1941 – in the centenary year of British occupation – four hours after the Japanese had struck at the American fleet in Pearl Harbour, Hong Kong found itself in the front line, when the 20,000-strong 23rd Corps of the Japanese Army threw itself at the 10,000 British and Commonwealth troops defending the colony. The Battle of Hong Kong lasted until Christmas Day, when the British finally accepted the inevitable and surrendered. Jehangir Ruttonjee avoided being interned in Stanley Camp after the Japanese victory, though he supported the smuggling of food parcels into the camp, where Indians were interned along with Britons, Canadians and other nationalities, and he housed nearly the entire Hong Kong Parsee community in his home, Dina House, in Duddell Street. Ruttonjee and his son Dhun were badly tortured by the Japanese after they refused to encourage members of the Parsee community to collaborate with the occupiers. Meanwhile the Hong Kong brewery was one of a large number of local businesses, including Lane Crawford’s department store, that were “taken over” by the occupying Japanese under the new governor, General Rensuke Isogai, with the brewery apparently “farmed out” by Isogai himself to a businessman from Osaka called Inouye Yahei. In March 1947 Ruttonjee – who had been awarded the CBE in the 1947 New Year’s Honours List “for courageous and loyal services during the enemy occupation of Hong Kong” – was visited by the author Compton Mackenzie, who described him as “the owner of the Kowloon brewery, a wealthy and respected Parsee.” That year, however, the brewery was sold to the San Miguel Brewery Inc, the Philippines brewer. It looks to have taken some months to sort out the handover, because the inauguration of the new San Miguel brewery was not marked until the following year, on May 21 1948, with a reception at the Hongkong Hotel attended by “hundreds” of Hong Kong’s leading businessmen, along with David MacDougall, the Colonial Secretary (that is, head of Hong Kong’s civil service.) The first stocks of freshly brewed San Miguel beer would be coming onto the market “immediately”, the brewery revealed. First-year sales volume was 4,000 hectolitres – around 2,500 barrels. That same year, 1948, Ruttonjee, who was now 68, donated HK$500,000 to fund the building of a tuberculosis sanatorium at the former Royal Navy hospital in Wan Chai, Hong Kong in memory of his daughter Tehmina, who had died of TB during an outbreak in 1943. It was said to be the largest donation to charity in the colony’s history. Ruttonjee’s total donations eventually reached HK1.3 million. The sanatorium is now the Ruttonjee Hospital. San Miguel carried on brewing at Sham Tseng until 1996, when it moved to a new brewery in Yuen Long, a few miles to the north, and where it still brews today. Meanwhile among the new breweries to have opened in Hong Kong in the past few months (that is, after I left to come back to the UK – blimey, I left London in 2009 and the place exploded with new breweries, I left HK in 2013 and ditto: what is this?) is one called Young Master, founded by Rohit Dugar, who was born in New Delhi – and who is clearly following the tradition set by Jehangir Ruttonjee. The architects who designed the Sham Tseng brewery, Leigh & Orange, are still running today in Hong Kong, and while all their records of the original brewery were lost in the Second World War, I was thrilled to find they still have photographs of the brewery from when they worked on it after the war, which they were happy to copy for me. San Miguel, too, also had photographs of the interior and exterior, and if you want to see a fine selection of those, and read an even longer version of the brewery history of Hong Kong, you can find it in the Winter 2013 edition of Brewery History magazine. Oh, and thanks are due to Evan Rail, for finding experts who could interprete those interior shots for me, and identify the various bits of 1950s lager-brewing kit. A view of the mash tun at the Sham Tseng brewery in 1959, with the brew kettle visible on the left and the lauter tun in the background. Absolutely excellent writeup — thanks Martyn!!! I’m actually wearing the Primo shirt I picked up in Hawaii as I read this; very interesting that those were the backers for the original Oriental Brewery Limited. Is there any connection with the modern-day OB, now brewed in Korea and the place where our much maligned Blue Girl is brewed? Or did Doosan just steal the name in the 1950s? No link that I know of, Jon. I think it was just one of those obvious names to use. Blue Girl, I believe, was originally a German brand, but don’t quote me on that. A compelling chronicle. I gather you found no evidence that ale or porter were brewed. The brands mentioned all seem to be lager. How could Hong Kong, still a Colony, forget so quickly the tradition of pale ale and porter/stout? Here was a chance as well to benefit from British preferences and use hops from England to make British-style beer. Brewing it locally, and with benefit of refrigeration, would only have increased the quality. Donuts to dollars the new craft breweries and brewpubs, perhaps in India too, are making APA-style beer if they make pale ale at all. I can’t understand this. Very interesting read, Martyn. I did not get a chance to meet you while you were in HK, but if you are back in town, definitely look me up. This has been inspirational. I’d love to visit this place and added it to my brewery destinations list. 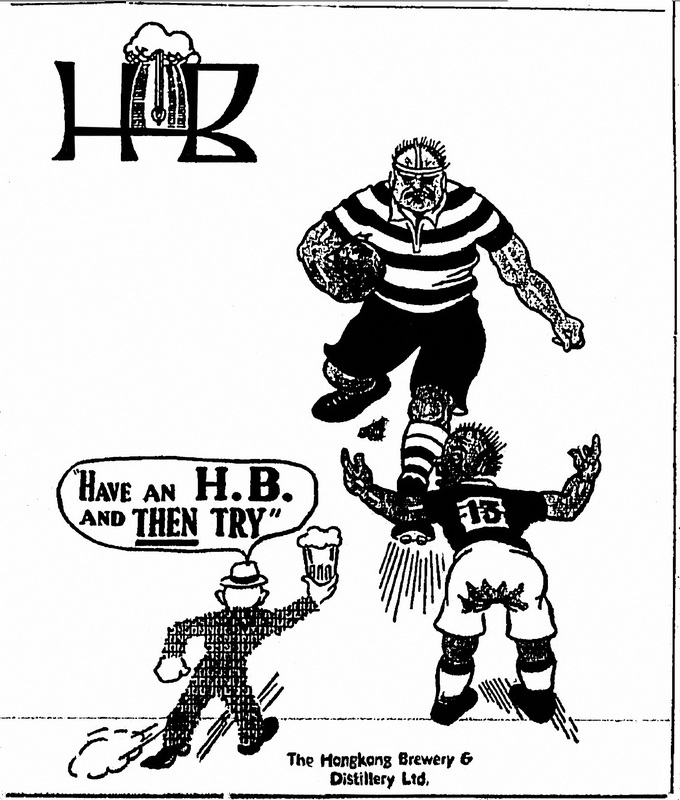 I just bought an old “OB Beer coaster” from the 1930’s and did some research on the brewery and found your article. If you are interested, just sent me an email, and I will sent you pictures of the coaster. This even might be a nice addition to your article. Fascinating, OLiver – yes please, I’ve sent you my email address. You are to be congratulated on your website. A mass of carefully researched and fascinating material. We have an interest in all aspects of manufacturing in Hong Kong – including beer! We already have an article about the HK Brewers & Distillers Sham Tseng Brewery. I would like permission to extract and post the information you included about this plant in your SCMP article, Roll out the barrel to complement the first article. I would be grateful if you would contact me.